MonoDAQ EtherCAT modules are used to drive valves and measure pressure in a test chamber to control the vacuuming process from DEWESoft Sequencer. The air is pumped out of the vacuuming chamber by a rotary pump. Two valves control the input and output flow of the air. 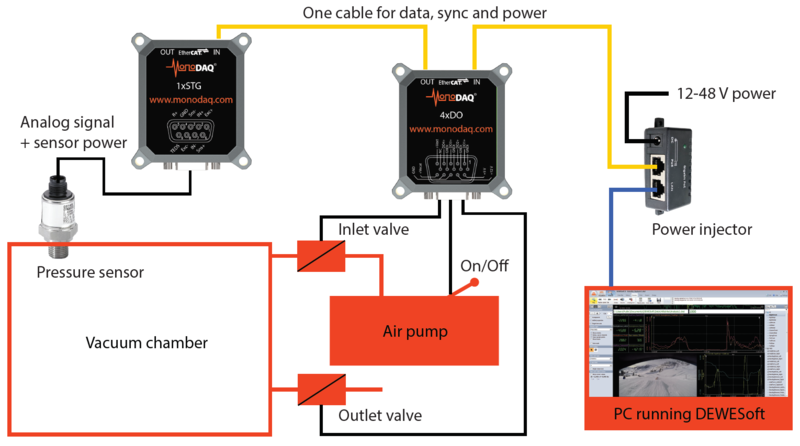 The pump and the valves are controlled by the MonoDAQ 4xDO EtherCAT digital output modules. A pressure sensor with current output is used for pressure feedback, the signal being acquired by the MonoDAQ-1xSTG current input channel. MonoDAQ-4xDO output module is able to directly switch the pressure valves without external relay. It can switch up to 60 V DC and drive currents of up to 2 A continuously and 3 A in peak loads. This simplifies machine automation as in the case of a test chamber for vacuuming. Analog measurement module MonoDAQ-1xSTG accurately measures the pressure in the test chamber as a feedback to the control sequence. This way a very accurate pressure level can be maintained for the purpose of testing or degassing a potting mixture. Thanks to EtherCAT interface the MonoDAQ modules can be daisy-chained with only a single network cable for data, power and synchronization. The data is acquired synchronously (1 microsecond) from each module. This simplifies the wiring around the test chamber and saves cost. DEWESoft Sequencer allows quick and easy development of the test chamber automation process: pressure can be controlled to follow a specific profile or a certain pressure level can be maintained. All the data can be recorded or exported to various file formats.